The retreat offers two tracts. The Intensive Tract is recommended for people who have completed the Introductory Workshop and who have a regular practice of Centering Prayer. Portions of Fr. Thomas Keating’s Spiritual Journey Series will be show for those on the Intensive Tract. The Post-Intensive Tract is for those who have previously made an Eight Day Intensive Retreat. The Post-Intensive offers increased silence and additional periods of Centering Prayer. 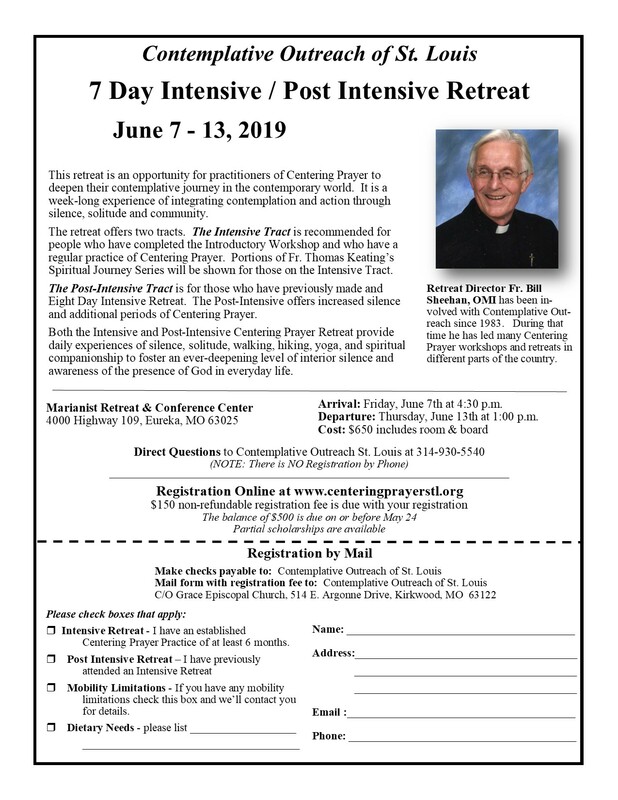 Both the Intensive and Post-Instensive Centering Prayer Retreats provide daily experiences of silence, solitude, walking, hiking, yoga, and spiritual companionship to foster an ever-deepening level of interior silence and awareness of the presence of God in everyday life. Registration: $150 non-refundable registration fee is due with your registration. The balance of $500 is due on or before May 24. Partial scholarships are available. Click here to download a printable registration form with complete details.